The best way to narrow down the digital divide is to digitally empower the children and the youth, who are the future of the nation. Oxfam report on inequality should be an eye opener for the world. Even while half of the humanity survives on meager earnings and probably going hungry to bed night after night leading their destitute lives laboriously in the most squalid conditions, a handful of people, who are blessed with an over-abundance, lead ultra-luxurious lives disregarding the pain and suffering of their fellow humans. This is the essence of the recent Oxfam report, which has shed light on the ever-increasing economic inequalities that reflect the pathetic nature of human society as a greedy, biased and highly-unjust arrangement. The pain of poverty and the resultant hunger are known to only those who have a first-hand experience of them. 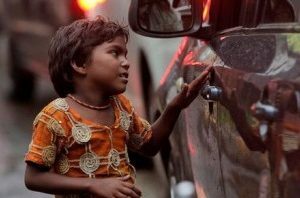 Leading a life of abject poverty not only involves experiencing the deprivation, but also looking at the gleaming wealth around them and cursing their fate. One of the salient findings of Oxfam report is while the ultra-rich are accumulating their wealth at a pace never before seen, the poor are getting poorer at an equally faster pace. The finding implies that the economic inequalities are only going to get strongly entrenched in the society and the condition of the poor and the downtrodden will only worsen. Hardly a day goes by without wereading and hearing about more investment, more production, more consumption and more savings that in-turn lead to more investment. Economists keep harping on the ‘more’and claim that it is a sure-shot path to prosperity. But it actually appears to be a vicious circle, which breads infinite greed and craving for ‘more’–more products and more services – to feed the demand of those who want to lead king-sized lives. Nations, in their pursuit of name, fame and one-upmanship, measure their prosperity in terms of GDP growth rates and those that are fortunate enough to have double-digit rates never miss an opportunity to brag about their prosperity. However, in this melee of growth rant, the humanity is unmindful of one fact: all the growth and prosperity is feeding only a select few and for an overwhelming majority of the people these growth numbers are not only incomprehensible but also don’t matter at all. The human society and its economy reached a sorry state where everything is “of the rich, by the rich and for the rich”, reducing the status of the poor into amere voiceless bystanders. Now the big question is what could be the remedy to treat this sick world, which is increasingly becoming inequitableand unsustainable? The human history is replete with efforts to make this earth a better place to live for all the humans. Philanthropic writers and thinkers dreamt of a utopian society where each and every human gets an opportunity to lead a decent and purposeful life. Unfortunately, Communism, which stood for the rights of the workers and fought for the establishment of an egalitarian society,appears to have lost steam midway though it was instrumental in bringing about a qualitative change in the lives of the working class. Can we revert to Communism? Probably no. It is a forgone conclusion that Communism only breeds an inefficient and lackadaisical public sector manned by white elephants, which will be instrumental in not distributing wealth but distributing poverty equally. This is indeed a sage advice. But who is ready to listen? The rich, who are neck deep in pursuit of more wealth, will never change their lifestyle. The excessive consumerism fueled by the hedonistic cravings of the rich and the upper middle class is polluting all the elements of nature, making the GDP growth-led development highly unsustainable. Unfortunately the elite liberal opinion makers don’t lose any time in lobbying for lowering corporate taxes and wooing big business with too many concessions. The technology explosion and the resultant ultra-automation are expected to result in the further depletion of employment opportunities for the poor and the middle class. Therefore, the need of the hour is to realize the fact that an individual’s welfare lies in overall societal welfare. The people, especially the rich, should be more forthcoming to fulfill their responsibility towards the society. If the rich feel that they can freely exploit the societal resources to promote their narrow self-interest disregarding the plight of the poor and the underprivileged, they are highly mistaken. What we presently see, however, is wide-spread tax evasion, the proliferation of tax heavens and very scanty Corporate Social Responsibility (CSR) activities. The realization must dawn on the society that the widening gap between the haves and the have-nots is a ticking time bomb and we will never know when it will explode. The pent up frustrations and anger of the have-nots may manifest in totally unexpected ways and ignoring themcould prove potentially disastrous to the future of humankind. And the signs of a backlash have already started appearing on the horizon. This globalized world, which witnessed an astounding growth for the last forty years, appears to be entering a phase of de-globalization. The poor and the downtrodden in various countries feel that the globalization has taken away their jobs and made their lives miserable. The right-wing populists, who have been waiting for an opportune moment to grab the spotlight by exploiting the fears of the poor and the middle class, started enjoying their heyday.Nobody expected Brexit would happen, and most importantly, nobody expected Donald Trump would occupy the top post in the US.Thedistressed common man on the street completely ignored the supposedly sage advice of the elite liberal opinion makers and exercised his option independently. History is a testimony to the fact that poverty and economic inequality are the breeding grounds for ultra-nationalism and rabid communalism. The Islamist terror that is causing havoc all across the world has its roots in the failed states such as Pakistan, Afghanistan andYemenwhere poverty is rampant. It appears that the humanity is passing through the most dangerous times, and if the world community does not take notice of the impending dangers and take corrective action, things may well go out of control. The need of the hour is to formulate policies that promote just, equitable and sustainable development which must lead to the promotion of maximum good for maximum people. 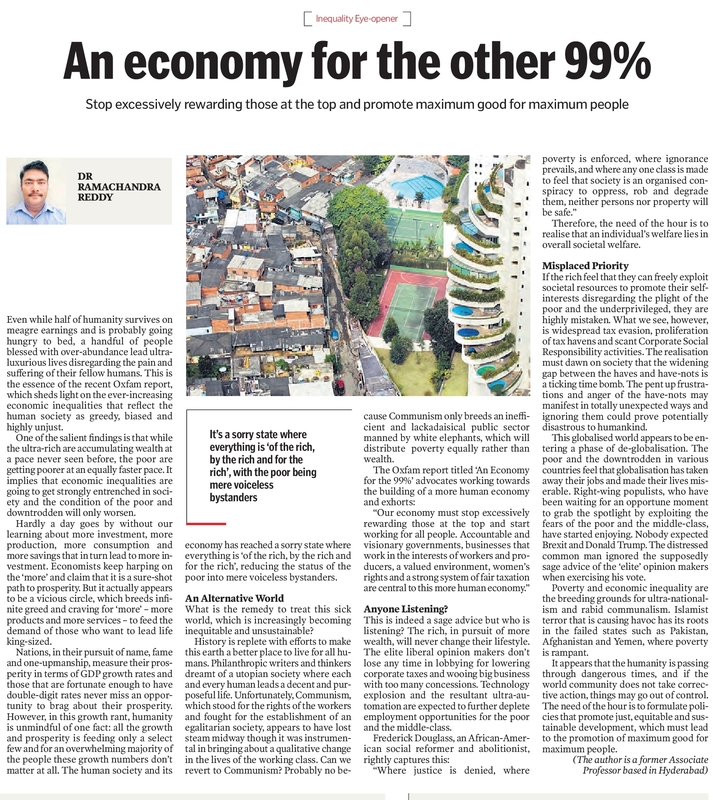 This article found place in the editorial page of the daily newspaper Telangana Today with the title “An economy for the other 99%”. This entry was posted in Economy and tagged economy, inequality, oxfam report, poverty on January 31, 2017 by Dr. Ramachandra Reddy.